The ocean is a potentially vast source of electric power, yet as engineers test new technologies for capturing it, the devices are plagued by battering storms, limited efficiency and the need to be tethered to the seafloor. Now, a team of aerospace engineers is applying the principles that keep airplanes aloft to create a new wave energy system that is durable, extremely efficient and can be placed anywhere in the ocean, regardless of depth. 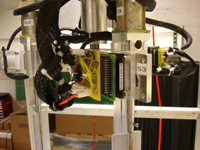 While still in early design stages, computer and scale model tests of the system suggest higher efficiencies than wind turbines. The system is designed to effectively cancel incoming waves, capturing their energy while flattening them out, providing an added application as a storm wave breaker. 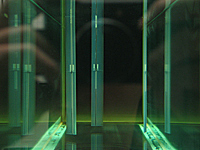 The researchers, from the U.S. Air Force Academy, presented their design at the 62nd annual meeting of the American Physical Society’s Division of Fluid Dynamics on November 24, 2009. A colleague had read an article on wave energy in a magazine and mentioned it to Siegel and the other team members, and they realized they could operate a wave energy device using the same feedback control concepts they had been developing. Supported by a grant from the National Science Foundation, the researchers developed a system that uses lift instead of drag to cause the propeller blades to move. Windmills have active controls that turn the blades to compensate for storm winds, eliminating lift when it is a risk, and preventing damage. The Air Force Academy researchers used the same approach with a hydrofoil (equivalent to an airfoil, but for water) and built it into a cycloidal propeller, a design that emerged in the 1930s and currently propels tugboats, ferries and other highly maneuverable ships. The researchers changed the propeller orientation from horizontal to vertical, allowing direct interaction with the cyclic, up and down motion of wave energy. The researchers also developed individual control systems for each propeller blade, allowing sophisticated manipulations that maximize (or minimize, in the case of storms) interaction with wave energy. Ultimately, the goal is to keep the flow direction and blade direction constant, cancelling the incoming wave and using standard gear-driven or direct-drive generators to convert the wave energy into electric energy. A propeller that is exactly out of phase with a wave will cancel that wave and maximize energy output. The cancellation also will allow the float-mounted devices to function without the need of mooring, important for deep sea locations that hold tremendous wave energy potential and are currently out of reach for many existing wave energy designs. While the final device may be as large as 40 meters across, laboratory models are currently less than a meter in diameter. 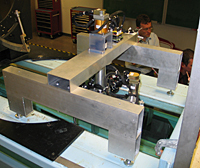 A larger version of the system will be tested next year at NSF’s Network for Earthquake Engineering Simulation (NEES) tsunami wave basin at Oregon State University, an important experiment for proving the efficacy of the design. The next source of alternative energy could come from ocean waves, and Air Force Academy professors have been granted funding to dive into this research. 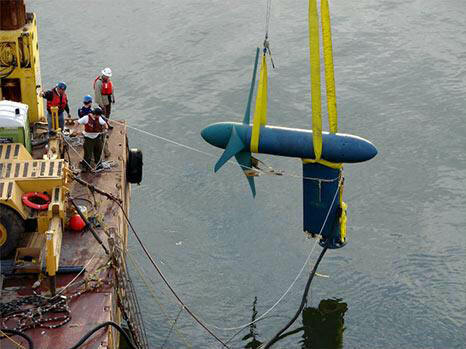 The National Science Foundation has awarded the Academy’s Aeronautics Department $285,619 to support a cyclodial propeller wave energy converter research project to harness the ocean’s power. The concept of ocean waves turning power-generating turbines is simple — put propellers underwater, then let the motion of incoming and outgoing waves, along with tidal currents turn the propellers and turbines to crank out electricity. But making those turbines efficient, effective and survivable in both shallow and deep water is what has prevented large-scale application in harnessing wave energy. But the Academy’s Aeronautics Department might be able to solve these problems. Years of research on military aircraft have given Aeronautics researchers the rare and necessary expertise in feedback flow control and fluid dynamics to potentially harness wave energy to meet the nation’s growing power needs. The Aeronautics Department will partner with Oregon State University to use their wave tunnel for some of the experimental side of this research project. Through both computational and experimental research, the Academy will pursue development of a wave energy converter based on cycloidal propellers, like those used on tug boats. These propellers’ main advantage is the ability to produce thrust in any direction perpendicular to the propeller shaft. This project investigates the use of cycloidal propellers for energy extraction from unsteady flow fields created by both deep and shallow water waves. Both of the three-dimensional flows are a challenge to energy conversion devices since they provide a flow field that fluctuates in time. Historically, wave energy converters have some drawbacks, one being the need for some kind of mooring to the ocean floor, which increases the cost of the device, as well as susceptibility to damage from storms. The cycloidal propeller based wave energy converters investigated in this project has the potential to overcome this and other problems of conventional wave energy converters, such as scalability to large power levels and efficiency of energy conversion. 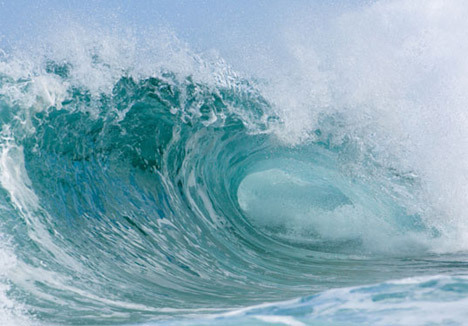 “Wave power has the potential to provide a large portion of the world’s electric energy needs, if it can be tapped in an efficient way,” said Dr. Stefan Siegel, who will oversee this research project. Cadets will also catch this wave, performing the basic research as part of the Aeronautics 471 class during their senior year. This project, which is funded through 2011, is part of a broader Air Force effort to address energy related issues and to support renewable alternative energies research.